Welcome aboard the exquisite Royal Rajasthan on Wheels train, your impeccable host for a journey into the beautiful land of Maharajas… This is travel the way it is meant to be; luxurious, leisurely and full of discovery. 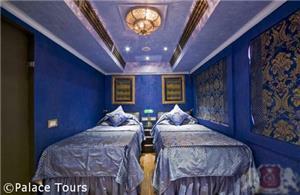 Journey back in time and relive the magnificence of a bygone age on this royal week-long odyssey. The majesty and splendor of the Royal Rajasthan on Wheels, with its comfortable and elegant compartments, delicious cuisine and superb service, combined with the adventure of a journey through the heart of India, is a truly unique way to experience the full wonder of this remarkable region. Delve deep into the heart of Indian history on a round-trip journey from Delhi through beautiful scenery and heritage destinations, where you will enjoy fabulous hospitality in castles, palaces and forts. 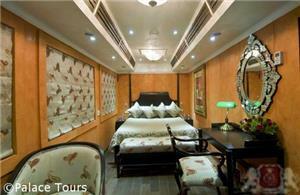 So sit back, relax, and let the Royal Palace on Wheels cater to your every need! 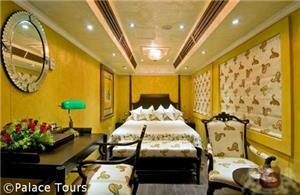 Come with us and take a regional train from New Delhi to Jaipur. 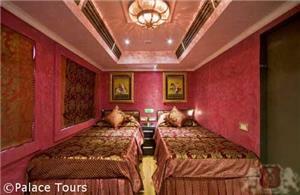 Upon arrival in Jaipur check in your luxurious hotel and get comfy. The rest of the day is at leisure. Overnight stay at the hotel. This capital city of Rajasthan, popularly known as the Pink City, was founded by Maharaja Sawai Jai Singh II in 1727 A.D. To explore the city, an air-conditioned private car takes you to the most beautiful sights. Later that night join the group to a dinner accompanied by a cultural performance. 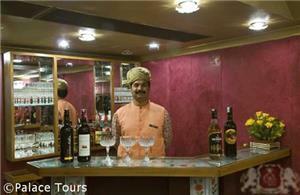 After dinner get a transfer to the train and check in to your comfy cabin on the Royal Rajasthan on Wheels. Thursday: Arrive this morning in Khajuraho, a city which exudes passion, eroticism, dance, and other forms of creative arts depicted in the sculpture and images of its temples. These 9th to 12th century temples illustrate the magnificent architecture during the times of the Chandela dynasty. The 85 temples were built in North Indian “Nagara” style, though only 20 of them have survived the harsh weather conditions over time. Return to the train this evening and travel even further back in time to Varanasi. Friday: Awaken in the holy city of Varanasi, whose history dates back over 3,000 years. Temples can be found at every few paces, including the Jyotirlinga Visvanatha Temple, or Golden Temple which was rebuilt in 1776 and dedicated to Lord Shiva. The Jnana Vapi Well, meaning “well of wisdom” is believed to have been dug by Lord Shiva himself. The Ganga Ghats (river front) are the most popular pilgrimage spot in Varanasi and are centers of music and learning. The holy city has been a symbol of spirituality, philosphy and mysticism for thousands of years and has produced great saints and personalities like Guatama Buddha, Mahavira, Kabir, Tulsi Das, Shankaracharaya, Ramanuja and Patanjali. 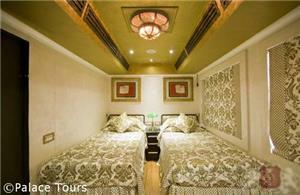 Today’s sightseeing tour includes visits to the Ganga Ghats, Maha Aarti, Buddhist temples at Sarnath and more. Return to the train and prepare for tomorrow’s journey further into Uttar Pradesh to visit the breathtaking Taj Mahal. 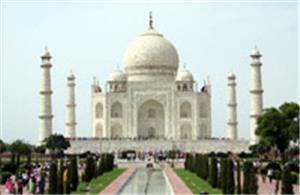 Saturday: Agra is one of the world’s prominent tourist destinations, boasting three impressive heritage monuments. Explore the abandoned Mughal palatial complex of Fatehpur Sikri, followed by a visit to the Red Fort. 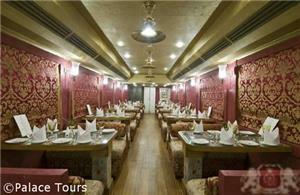 Enjoy lunch at a five-star hotel and later, explore the Taj Mahal, one of the seven wonders of the world. This pristine monument of undying love was built by Emperor Shah Jahan in memory of his beloved queen Mumtaz Mahal. You also have an opportunity for shopping, as Agra is known for its splendid marble inlay work like the Pietra Dura work on the Taj, leather goods and jewelry. 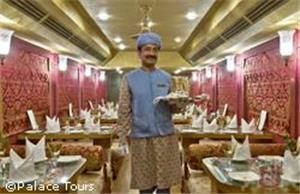 Dinner is served on board as the train makes its final departure for Delhi. Sunday: After a good night’s sleep, arrive at Safdarjang Railway Station and let the pleasant memories of the past week linger on your mind for a long, long time. 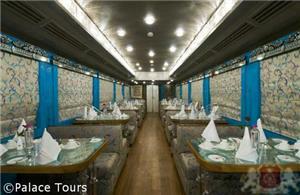 Enjoy breakfast on board and disembark the train by 7:30 a.m.